The prose poems in my chapbook, Obscura: The Daguerreotype Series (Finishing Line Press) were written off of these images. I've posted a few of the poems as well. This manuscript was selected by Denise Duhamel as runner-up in the 2006 Caketrain Chapbook Competition. "Julie Gard’s Obscura: The Daguerreotype Series is a mysterious and rich literary photo album. Each ekphrastic prose block reinforces—by its elegance of phrasing, by its very shape—a meditation on the visual. Gard’s writing is crisp, elusive, nuanced, and shadowed. 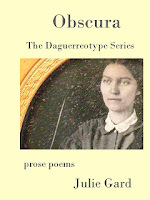 Obscura is a gorgeous book."